Meaning: This is a fundamental exercise performed by the 10th Kup student. Learn your pattern with Miss Jones. Move the right foot to C forming a left walking stance toward D while executing a low block to D with the left knife-hand. Move the right foot to D forming a right walking stance toward D while executing a middle side block to D with the right inner forearm. Move the right foot to A forming a left walking stance toward B while executing a low block to B with the left knife-hand. Move the right foot to B forming a right walking stance toward B while executing a middle side block to B with the right inner forearm. Move the right foot to D forming a left walking stance toward C while executing a low block to C with the left knife-hand. Move the right foot to C forming a right walking stance toward C while executing a middle side block to C with the right inner forearm. Move the right foot to B forming a left walking stance toward A while executing a low block to A with the left knife-hand. Move the right foot to A forming a right walking stance toward A while executing a middle side block to A with the right inner forearm. Move the left foot to C forming a left walking stance toward D while executing a low block to D with the right knife-hand. Move the left foot to D forming a right walking stance toward D while executing a middle side block to D with the left inner forearm. 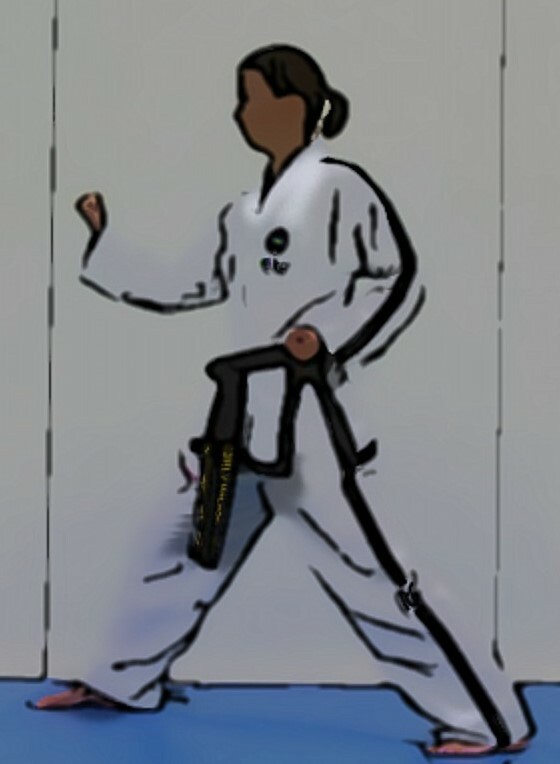 Move the left foot to B forming a left walking stance toward A while executing a low block to A with the right knife-hand. Move the left foot to A forming a right walking stance toward A while executing a middle side block to A with the left inner forearm. Move the left foot to D forming a left walking stance toward C while executing a low block to C with the right knife-hand. Move the left foot to C forming a right walking stance toward C while executing a middle side block to C with the left inner forearm. Move the left foot to A forming a left walking stance toward B while executing a low block to B with the right knife-hand. Move the left foot to B forming a right walking stance toward B while executing a middle side block to B with the left inner forearm.